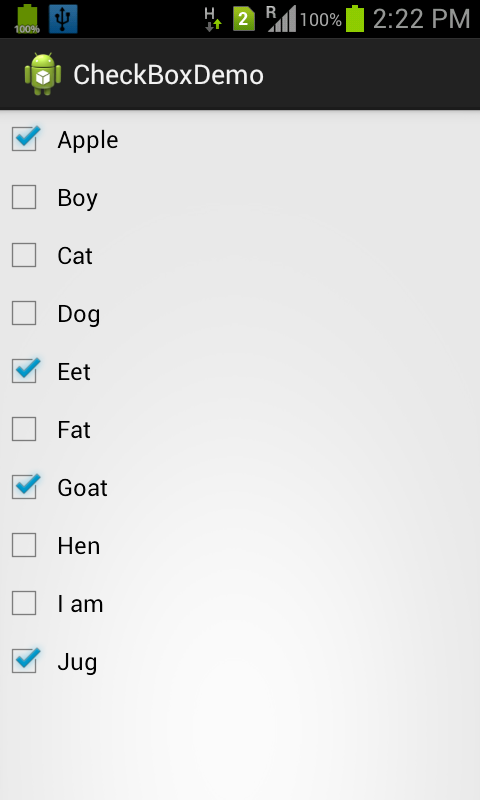 Today I am sharing very important code for dynamic check-box in android. Main part of this demo is manage dynamic click of check-box. Just copy paste below code and modify according your need. Hello sir, your tutorial is great. but i have one query that i have arraylist which i have populated into listview and one customadapter class where using getview method i set. i.e eachrow has one textview and checkbox. i want to do when checkbox is clicked or checked corresponding textview is removed.i.e list.remove(position) so, how can i get checkbox position into listview . thanks. I think if you want remove any item on check then use delete button instead of checkbox. because checkbox use is perform task on selected items not for single item.Anyway its all your logic, do as your requirement. 1)Add a delete button any where on your layout. 2)set id for all of your checkbox. 3)on delete button press get all selected id and remove that row from your list. 4)if you are using webservice update your server with that deleted item and if local sqlite or any other collection framework just update that. 5)refill your adapter on notifychange. Hello sir, I have Arraylist into bean class@Line 1 Below. I have mainActivity class @ Line 2 Below where i set data to listview using myAdapter(CustomAdapter class). each row has one textview and checkbox. i want to do when checkbox is checked i want to obtain that checkbox position so i can remove corresponding textview so, i used below l1.remove(i) it' s work find but what happen i have to click on listview item to remove the item but want to remove when checkbox is checked or clicked i want to remove corresponding item. thanks. Hmmm so very ease just remove arrayList item on check-box clicked. and for getting that potion you can get easily using my multi click demo.. In your adapter get position and that delete that item from list and update your UI again. Thanks a lot sir..i will follow ur guidelines. When i checked only one checkbox and press button it's removed corresponding textview but when i unchecked it it also removed corresponding textview. When i checked first item into list and third item into list it's give me exception java.lang.IndexOutOfBoundsException: Invalid index 2, size is 2 it's only checked one item at a time. so, how can i achieve when unchecked checkbox is not removed corresponding textview and also multiple item i checked can remove item when button is pressed.. following is my code what's wrong with in that..thanks. hello sir, have u checked my previous post what i have to do to achieve that ..thanks. ok sir, thanks.you are great for trainee. Thanks Viral, and i am not great, just want share knowledge with others. Actually i am some busy now in these days so i did not see your code. But no worry I will give you demo code when i got free. Till then try at your end if you got any luck let me know. Otherwise till then you can work on others module. Why should we answer? You are not a good developer? you can't do it by yourself? Are you paying to us? we are here for helping people who really need help not like you claiming challenges. This is a free web site and I am owner of this web site, if you find anything helpful from here that's good and if not go and find some where else but think ones if someone help you in your code means he is consuming his/her time from their schedule and someone writing blog or answering on stack-overflow you must respect to him/her. If no one share their knowledge you will struggle. Hope you can understand now. Best of luck and your comment is not an issue for me i can delete in a minute but i don't care what you are writing and why. And still you have any doubt let us do have a deal pay $250 for my time I will give your solution. And if not I will pay you $500. OnCheckBox selected you will get a ID in logcat. It is not last one. how to download your example ???? Is This....... recyclerview with checkbox complete example..
Hello Sir,whenever I go out of an activity,dynamic checkbox disappears.How can I make that dynamic checkbox permenant whenever that activity is in start or resume or resatrt state?